When we’re in pain, we have two choices: We can pay attention to it and heal it or we can suppress it, ignore it, and pretend like it doesn’t exist. But thinking that we’re healing the wound by pouring pink paint over it with a simple affirmation isn’t going to do the trick. That’s where the limitation of affirmations hits a brick wall. Saying “Everything’s great,” when it clearly isn’t, is a lie. Pretending that our marriages are fine when they’re far from it, is a lie. Telling ourselves the story that I can just learn to live without love is a lie. And it’s just too damn exhausting to lie to yourself over and over. Allow it to be what it is. Whatever pain it is – your lack of confidence, your troubled relationship, your broken heart, your painful thoughts, your fears – just allow it to be there and to be present….without judgement, without trying to suppress or change it and without trying to cover it up with the lie of pink paint. When you allow it just to exist without resistance, the weight of it lightens. 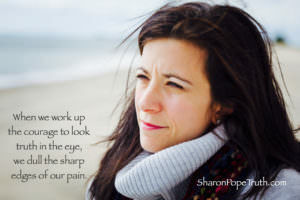 When you work up the courage to look truth in the eye, its sharp edges dull. I’m not where I want to be, but I can sense that I’m getting closer every day. I may not know what the future holds, but in this moment I’m alright. These desires I have on my heart…I didn’t put them there, so I can’t get rid of them either. I might as well embrace them. My heart may be shattered, but at least I know that when I love, I love deeply.